In October 2017, we attended the International Association for Adolescent Health, 11th World Congress on Adolescent Health in New Delhi, India. We were really excited to contribute to the global dialogue on adolescent sexual and reproductive health, particularly given our work on the Adolescents 360 (A360) programme. Itad, the London School of Hygiene and Tropical Medicine (LSHTM) and Avenir Health are working together to evaluate and develop learning from A360. Evaluation of Adolescents 360: Building the evidence base in the application of human-centred design in adolescent sexual and reproductive health (ASRH). At the conference, both implementers and evaluators of ASRH programmes were very interested in learning about our multi-component prospectively designed evaluation. 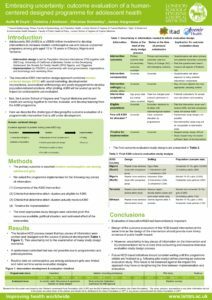 They were surprised to see an outcome evaluation being complemented by an additional three components – a process evaluation, a cost-effectiveness study and a cross-cutting engagement and research uptake component. Often it appears that they expected the process evaluation to be added on retrospectively and done in a less systematic and rigorous way; and few evaluations they had been involved in also included a cost-effectiveness study. Many were very enthusiastic about our approach and the potential for generating a rich source of qualitative and quantitative data from the different technical evaluation components in order to give a comprehensive account of change, causality and attribution to the programme. They also liked the idea of feeding results into programmatic decision-making in real-time to maximise impact. There was great excitement and buzz about the potential for HCD to increase the impact of ASRH programmes. The HCD approach shifts away from a typical model, where programmers design programmes, often in isolation from the end-user, to one where adolescents and adults from a range of disciplines design programmes together – conducting formative research as inspiration for the design, prototyping concepts and ideas directly with adolescents and iterating based on feedback from the adolescents themselves. 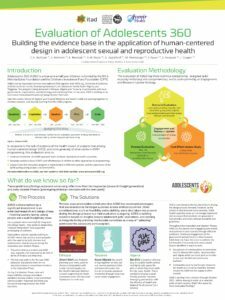 HCD is a recent addition to ASRH programming and is being invested in and used by a growing number of funders, designers and implementers as an approach to solving complex health and social problems in adolescents. 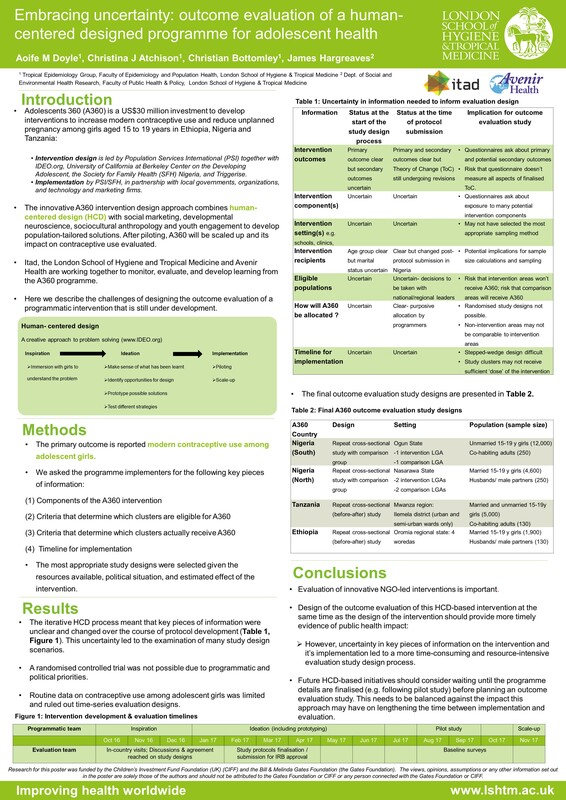 However, evidence around the effectiveness of HCD interventions in ASRH is limited to date. In this context, the evaluation of A360 feels even more relevant and valuable to the sector. Watch this space for more findings from the evaluation!